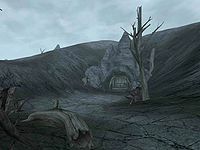 Shushan is a small slaver's cave just a short distance southwest from Uvirith's Grave in the eastern Molag Amur region. Inside is a nice stock of gold and gems. Two Argonian and Khajiiti slaves can be freed here. The slave key is in the possession of Evilu Indrano. She also carries a copy of the Hand-to-hand skill book Master Zoaraym's Tale and a copy of the Light Armor skill book Ice and Chiton. In addition to the eight people, there is also one nix-hound inside. Both of the doors inside are trapped.